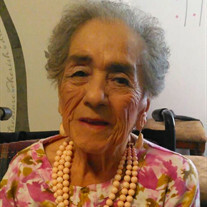 Guadalupe Z. Rivas, age 97, entered into rest on Saturday, April 13, 2019 in San Angelo, Texas. She was born on September 30, 1921. Services are pending with Flores Funeral Home in Acuna, Coahuila, Mexico. The family of Guadalupe Z. Rivas created this Life Tributes page to make it easy to share your memories.